Roadrunners are bold, active birds. At times also very vocal, from a mechanical clicking sound that is repeated rapidly to a strange moaning sound that I could not attribute to any known bird or animal when I first heard it. 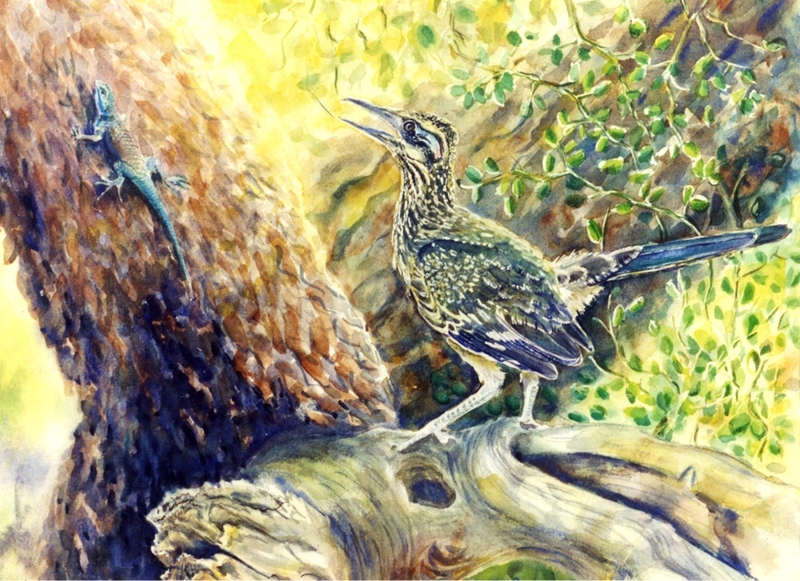 Young Roadrunner -note the short tail - chasing a lizard. This one easily escaped. 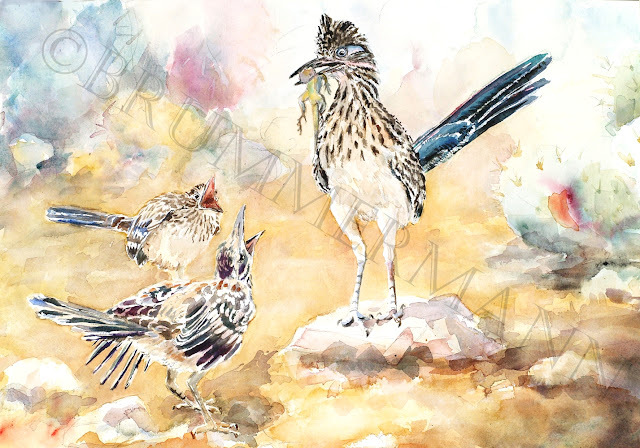 Roadrunners are THE caricature-characters of the desert Southwest. Together with the trickster coyote they are known to children around the world. And I must say, watching the real bird, with all its velociraptor fierceness, is much more interesting and even amusing than all those cartoons. 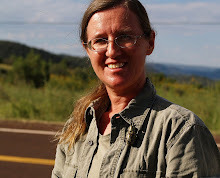 Immediately after my arrival in the southwest, I experienced them as skilled, opportunistic predators who didn't refuse a juicy bug, grabbed tadpoles out of my aquarium, did not spare the occasional song bird, but also did not back off from a rattlesnake. This fierceness increases exponentially when a hungry brood is waiting. My friend Doris Evans documented how even little chicks devoured whole lizards that the parents delivered to a nest in her yard. Compare that to the little bits of meat that mother hawk carefully feeds her chicks! Doris was lucky to have the nest so close to her window that she missed no details of the nursery. Over the years I watched two nests in Sabino Canyon, but from a safe distance: What was going on there was surprisingly quiet and secretive. Here at home, we see and hear all the preliminaries for nesting and breeding, like the gift-giving from male to female and the haunting, moaning cries that seem to claim a territory, but then it gets eerily quiet: the Roadrunner parents are not betraying the location of their nest and vulnerable young-ones by a lot of obvious activity. 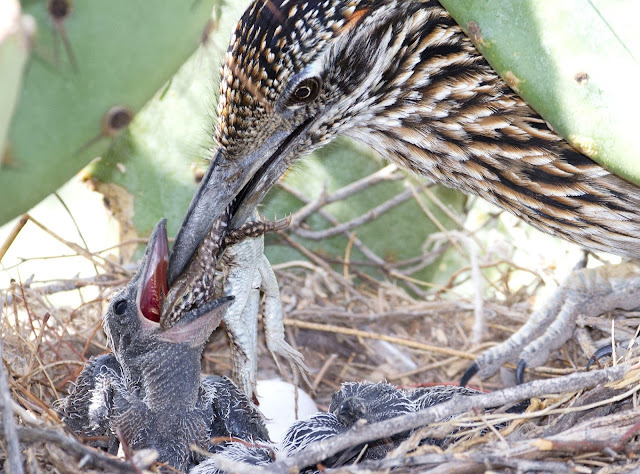 The nest is out in the open, if concealed by a prickly cholla cactus, and roadrunner chicks are born featherless and blind, so it takes a while for them to reach fledgling status. But when the chicks are finally out of the nest, they soon carry on with the typical boldness of their species. First they mostly follow their parents around to noisily demand their lunch, but soon they begin to bother everything that's smaller than they and check it out for prey-value. They explore every place that could hide any morsels, including the inside of my parked car and my friend's computer desk. I have seen them watch the tail of my cat with the worst of intentions, and a friend who was hunting bugs for scientific, not culinary reasons, found them following him around, hoping for a hand-out? The ones in Sabino Canyon seem to quickly learn the schedule of the tourist tram. I saw bits of hamburger tossed to them, which is of course absolutely wrong. Don't do it. So my latest painting is about the hunger of the dragon brood. It sold as soon as I put it up on Facebook.